Dedication. Development of Diagnoses and Definations of Autism and Related Disorders. Etiology and Prevalence. Assessment. Interventions by Class of Behavior. Comprehensive Treatment Models. Pharmacological Treatments. References. Early Intervention for Autism Spectrum Disorders is the first in a series aimed at addressing the rapidly expanding field of assessment and treatment of children with mental health issues and/or development disabilities. Early Intervention for Autism Spectrum Disorders is aimed at the researcher of practitioner who works with those young children with Autism Spectrum Disorder. In addition to covering major research developments in differential diagnosis and early intervention, the author's provide a critical review and analysis of core concept that define this area. The first chapter of the book reviews the development of definitions of autism along with early methods for diagnosing this area of developmental disabilities. 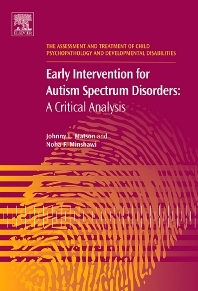 Chapter two covers some of the most discussed theories of etiology along with a review of prevalence and the author's opinions on why the number of children diagnosed with autism spectrum disorder has increased markedly in recent years. A chapter on the most commonly used assessment methods and a critique of the psychometric properties of each is followed by three chapters on treatment. We have broken the treatment chapters down based on type of intervention. The first treatment chapter covers specific target behaviors or small sets of behaviors. A second chapter covers training for the packaged comprehensive treatment models with particular emphasis on the TEACCH, UCLA-YAP and the University of California Santa Barbara Autism Research and Training Program. Each of these programs gives a unique perspective on treatment for these young children. The final treatment chapter covers the recent developments in pharmacotherapy for autism spectrum disorder, with a critical analysis and review of the data. We hope the overview presented proves to be of interest to researchers and practitioners in the field. We present one perspective on this exciting and innovative area of research and treatment. Hopefully, it will serve as one useful source to those who wish to provide the most up to date evidence based intervention to these young developmentally challenged children. Researchers and Trainee Clinical Practitioners working in rehabilitation, mental retardation, psychopathology, special education, and social work.